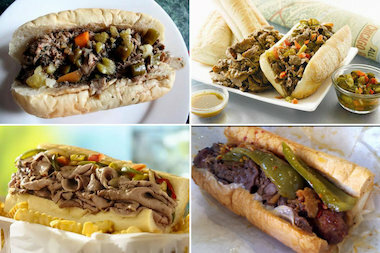 ItalianBeef.com is a website devoted to fans of Italian beef in Chicago and its suburbs. The site reviews and rates area restaurants that serve Italian beef. CHICAGO — David Fowler never gets tired of eating — or talking about — Italian beef. The Gold Coast resident is co-owner of ItalianBeef.com — a website devoted to reviewing and rating restaurants in Chicago and its suburbs that serve Italian beef, sharing recipes featuring Italian beef and selling beef. "People love our site — it's all about Italian beef and everything to do with Italian beefs, so what's not to like about it," Fowler said. "When people come to the site, they find what they are looking for, whether it's a location of a place that serves Italian beef, their favorite recipe if they are looking to make it themselves, or, if they are wanting to order and have some shipped to their door since they are one of the unfortunates that no longer lives in the beloved city." The site, which has been active for about four years, also has a Facebook page with several thousand fans and a Twitter account. Its city reviews are bracketed into Downtown, North Side, South Side and West Side locations, with a different section for suburban spots. Fowler said most of the folks visiting the free site he co-owns with Nick Favia, whose family runs Italian beef wholesaler Bari Beef, are looking for recipes from spots like Portillo's, Margie's and Johnnie's. He also said a popular feature is where visitors can upload photos and videos of them eating Italian beef. Fowler, whose favorite Italian beef joints in the city are Mr. Beef on Orleans Street and the Al's Beef locations on Taylor Street and Adams Street, said operating the site has been "a treat." "I have not had a single person yet tell me they did not like Italian beef," he said.